According to a 2012 report by the American Community Survey, the following cities have the highest rate of residents who walk to work. Pedestrians crossing a busy intersection. In the United States, walking to work is less common than public transportations or private automobiles. However, walking still plays a major role in complementing other transport systems in the nation. Cities have recently been improving infrastructure to promote pedestrian commuting. This includes the creation of sidewalk lanes and pedestrian centers. Despite its overall low popularity in the United States, some cities display a high number of pedestrians. Most cities with a high percentage of pedestrians are college towns or military bases. Ithaca is located Tompkins County, New York, and is home to Cornell University, an Ivy League school. Ithaca has the highest number of pedestrian commuters in the US, with 42.2% of its commuters as pedestrians. The city dedicates a lot of support to promote pedestrians as opposed to vehicles because walking reduces environmental pollution through carbon emissions. Walking is popular in Ithaca because of the high population of students. The city has done a lot of pedestrian improvement projects, including the construction of new sidewalks and traffic signal upgrades for safety. Athens is a city located in Athens County, Ohio, and is a historic college town and home to Ohio University. Athens has the second highest number of pedestrian commuters in the United States. The biggest segment of the population who walk rather than driving or using public transport is students, who walk from their homes to campus. There has been an improvement in pedestrian infrastructure to ensure safety. The majority of the students choose walking as a way of reducing transportation expenses and because of the close proximity to the university. State College is located in Centre County, in the Commonwealth of Pennsylvania, and is ranked third in terms of pedestrian commuters. The city is a college town whose economy has been greatly influenced by the University Park campus of Pennsylvania State University. Walking is the most popular way for students to get to campus, and 36.2% of the town's commuters are pedestrians. There are sidewalks and lighted pedestrian lanes that help enable safe walking. In the three cities listed above, more than 36% of commuters are pedestrians. However, there are many cities with more than 28% of commuters as pedestrians. Theses cities include Illinois' North Chicago, New York's Kiryas Joel, and Ohio's Oxford. The cities that record the highest amount of pedestrians are mostly college towns. This is explained by the fact that students usually live near the campus and prefer to save money commuting. 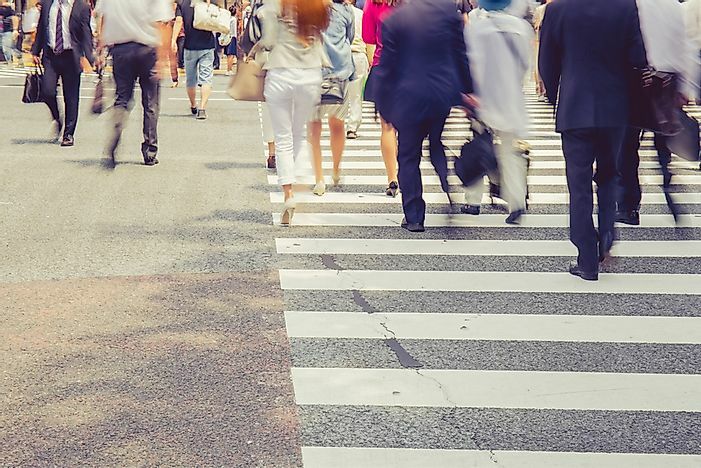 Cities should encourage walking to work as opposed to using vehicles because it is safer and more environmentally friendly. Pedestrian infrastructure should be improved to enable safe and easy navigation.